(CelebrityAccess MediaWire) — New Zealanders Split Enz have sold out two Australian concerts in Sydney and Melbourne in less than two hours and have added second shows in each city. 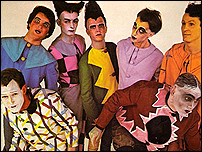 “The Split Enz legend continues to grow with the band selling even more tickets today than they did in their heyday," said promoter Michael Gudinski of the Frontier Touring Company. The band will perform in five Australian cities in June.